Star Wars Rebels review: "The Call"
Right off the bat, I will admit that I am a sucker for space whales. The Voyage Home is my favorite Star Trek movie. But a cool-looking interstellar cetacean is nothing without a well-developed story surrounding it, and "The Call" ably met that challenge as well. The clash between Hera's pragmatic priorities and Ezra's more sensitive instincts, plus the purrgil's own role in resolving the final conflict, reflected some of the Star Wars saga's most enduring lessons. Character development, high-level takeaways, witty banter, and an acknowledgement of an underexplored meta-level reality for the rebels—this episode had it all. Ezra learned a lot in this episode. When he first encountered the purrgil, they were a mystery. He was the only Ghost crewmember who picked up the noise they made—likely because the sound carried through the Force and only Ezra was sufficiently attuned to the behavior of the animal world. We've seen him calm and redirect loth-cats, so this was nothing new. In fact, it was a great way to build on the portrayal of that subspecialty of his Force powers. Even Kanan, a more powerful and experienced Jedi, didn't "hear" the purrgil, because he wasn't as good at fostering connections with animals. Ezra's first reaction to the purrgil was child-like amazement. He didn't understand them very well, but he was very interested in them—and, importantly, not scared of them, unlike Hera, who, for reasons that will be discussed later, reacted with a closed, rather than open, mind. Kanan, reacting like a supportive Jedi Master, endorsed Ezra's friendly approach to the purrgil, urging Hera not to shoot them. I enjoyed seeing Ezra refine his ability to sense the feelings and intentions of other animals; it paid off for the Ghost crew when he sensed the purrgil calming down. Kanan seemed proud of Ezra in that moment, while the younger Jedi, analyzing his instinct for compassion, said that it "just seemed like the right thing to do." It's worth noting that the entire episode turned on Ezra's ability to decipher the creatures' behavior. It was his sense that they were rerouting and that the Ghost should follow that brought the rebels to the fuel refining station. When Sabine's calculations confirmed Ezra's hunch, Kanan made sure to point it out to Hera. His exaggerated line—"That's so interesting! "—wasn't just an excuse for comedy, although this episode was rife with funny moments. Instead, Kanan was making a serious point: that the Force worked in mysterious ways, and that Hera should be more trusting of Ezra's instincts, despite her own misgivings about the purrgil. Even in the midst of preparations for a high-stakes fuel theft, Ezra remained distracted by the purrgil. He was the only one who paid attention to their behavior as the Ghost surveyed the fuel depot from above. He noticed them dipping in and out of the gas while the other rebels planned the attack. Naturally, this observation became significant later in the episode, when Ezra's interest in the creatures' behavior led to them saving the rebels from capture. Importantly, though, Ezra also saw—and became angered by—the station workers shooting at the purrgil. To someone with his Force-fueled instinct for compassion, the idea of shooting at the purrgil was unconscionable. But Ezra didn't see it as equivalent to stepping on a bug. He seemed to recognize that the purrgil were deeply intelligent creatures, with agency and intent beyond that of most non-sentient species. Hera thought of them as mindless monsters. Ezra recognized that they had reasons for behaving in certain ways, and he wanted to decipher those reasons. Yet Ezra continued to struggle to make his voice—and his advice—heard. No one, not even Kanan, paid attention to his interest in the miners shooting at the purrgil. He correctly hit on a major connection between the purrgil and the fuel, but everyone discounted his intuition—even Hera, who usually nurtured his creativity. I initially read this as out of character for the two senior rebels, who typically worked in tandem to encourage Ezra to think creatively. But in this case, it made sense that everyone would be preoccupied with the practical concern of refueling, while Ezra basically daydreamed about animals. Ezra was the only one who saw past the urgency of the moment to develop an affinity for creatures beyond his immediate zone of concern—and that fits nicely with how he is being developed on Rebels. Ezra's bond with the purrgil only deepened once he left the Ghost. When several of the creatures came up alongside the descending rebels, Ezra marveled at being so close to them, at their size and beauty and majesty. He clearly respected them—and they seemed to be calm around him. It was this concern for their wellbeing that led Ezra to stop Sabine from detonating the gas, which he had begun to suspect was vital to the purrgil's survival. Kanan placed a lot of trust in Ezra's instincts and priorities by letting him reconfigure their plan. In other circumstances, the rebels wouldn't hesitate to protect innocent animal life from oppressive sentient beings, but here, everyone besides Ezra was more interested in protecting themselves than in more secondary issues like animal welfare. The payoff to this extended development of a bond between Ezra and the purrgil came when he found himself suffocating in the gas cloud and one of the creatures offered him his helmet. Ezra and the purrgil shared a deep, Force-fueled connection inside the gas, visually signified by the strange hyperspace effect that appeared in both beings' eyes. This was how Ezra learned that the creatures needed the gas to recharge on their long journeys—journeys that, as the audience soon learned, involved an amazing technique. Only Ezra could have bonded with the purrgil in the way that he did. It wasn't just that, as a Jedi, he was unusually attuned to their "wavelength" of thought and communication; it was also that he, Ezra Bridger, possessed a unique interest in animals and their behavior. The purrgil on which Ezra had landed recognized that he was different; it sensed his good intentions, and in return, it saved his life. Rebels was teaching us the benefits of compassion and keeping an open mind. Hera most certainly did not maintain an open mind during this episode, and to an extent, I can understand her anxieties and frustrations. As the captain of the Ghost, its fuel level and operational status were primarily her responsibility—as were the survival of its oxygen- and heat-dependent crew. Whereas Ezra could dip into the Force and indulge in momentary connections with strange beings at moments of relative quiet, Hera was always on alert during this episode, constantly trying to figure out how to reroute subsystems and jury-rig additional power for the next minute adjustment on their course to hopeful salvation. None of that excused Hera's closed-mindedness, of course. While Ezra was amazed by the purrgil, Hera scolded him and Kanan for being naively fascinated by them. Kanan angrily retorted that maybe she should explain herself, so she did. And her explanation offered further context for her wary reaction to the purrgil. Her spacefaring experience had taught her that the creatures were just menaces, that they disrupted hyperspace travel and got people killed, despite legends about them inspiring the development of interstellar travel. Despite Ezra's attempts to convince her that the purrgil didn't mean any harm, her travels had hardened her, had taught her not to take any chances—and now she had a crew, not just herself, to worry about. She wasn't interested in giving the purrgil the benefit of the doubt. When she heard that Ezra's concern for the purrgil had changed their plan, she grumbled, "Not the purrgil again," as if they were the subject of a child-like obsession on Ezra's part that had gone from a cute diversion to a dangerous distraction. She clearly thought of them as pests: She had carefully planned an operation, and now these mindless creatures were interfering with it. By the end of the episode, though, even Hera was forced to admit that the purrgil had saved them. The purrgil's role in the Ghost's survival and escape were a reminder to Hera—and to the audience—that things are not always as they seem. Ezra's connection to the purrgil was the focus of "The Call," but this episode also managed to pack in a few other great elements. I enjoyed the basic premise—that the Ghost was running low on fuel, and that Hera had to ration it to the point that even the cockpit door had to be pried open manually—because it reminded the audience of the difference between the rebels and the Empire. Imperial ships have everything they need and ample secure locations to restock in case they run out of something. Rebel ships aren't just older and less powerful than the Empire's war machines; they're also much more vulnerable to disruptions due to the loss of basic components like fuel. When an Imperial ship is running low, it simply travels to a nearby depot. When a rebel ship runs low, it might have to undertake a complex and risky side mission just to top up again. I also thoroughly enjoyed the humor in this episode, which I found to be more refined than the often over-the-top, in-your-face shtick that defines children's cartoons. Sometimes it was a throwaway line, like Ezra saying, "Well, I'm getting nothing on the ol' visual scanners," or Kanan complaining, "I can't believe we're going to lose to this guy." Other times it was a quick-witted back-and-forth, like when Kanan commented on the tactic of following the purrgil by saying, "It's not the strangest thing we've ever done," and Hera shot back, "Yeah, that doesn't make me feel better." (Another funny back-and-forth was when Hera said, "I thought you said the landing platform was secure," and Sabine replied hurriedly, "Temporarily! I said temporarily secure.") Other times the humor was more nuanced, such as when Kanan began to crow about the wisdom of not shooting the purrgil (because it would have wasted needed laser energy) and Hera switched off the comm system. When Kanan came into the cockpit to finish his sentence, recognizing that he was annoying Hera but not caring, it reminded me of the dynamic between a smarmy Han Solo and an exasperated Princess Leia in The Empire Strikes Back. And then there was the moment when Kanan discovered that Sabine had painted his helmet in a riotous design that was anything but intimidating. "You said you just wanted to look at it!" Kanan exclaimed. "I did look at it," Sabine deadpanned," and it looked bad." It was like she couldn't help but be artistically expressive when she saw a canvass—or an offensively bland piece of armor. One imagined Kanan grimacing under his helmet as he prepares to go into a mission with Sabine's unique artwork covering his face. It's small moments like these that help weave strong threads of character development through episodes that are focused elsewhere. "The Call" is a master class in the judicious use of episode time to serve core story and world-building goals. Most obviously, it built on Ezra's affinity for animals and strength in the Living Force. 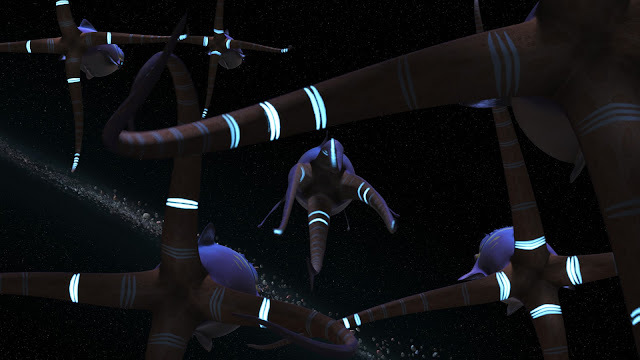 But it also used its exotic, almost regal space whales to convey two important themes that pervade the Star Wars galaxy. On a basic level, purrgil expanded the portrayal of alien life in the galaxy, making it feel more like a strange, unexplored place, especially out on the fringes. As we learned in the episode's final moments, the purrgil weren't just unusually perceptive, able to detect incoming TIE fighters; they could also travel through hyperspace on their own, validating the old legends that Hera had heard. This was the perfect way to show that the galaxy was a bizarre but wonderful place, full of majestic, hard-to-comprehend things. The purrgil's very existence emphasized the notion that you never know what you'll find out in the far reaches of space. And, frankly, the idea of lightspeed-equipped space whales was just really, really cool and fun. But on a subtler level, the purrgil's role in the rebels' victory over the Imperial-serving fuel miners also echoed one of the most consistent themes in Star Wars: the triumph of simple, sometimes strange goodness over sophisticated evil. From Gungans holding their own against battle droids to Ewoks defeating stormtroopers, George Lucas regularly imbued this type of conflict into the six films, and Rebels did the same with the purrgil. The mining boss considered the purrgil to be disgusting, just as the Imperials on Endor considered the Ewoks to be loathsome pests. The message—one that fit perfectly into the saga's underdog narrative—was clear: You underestimate and abuse seeming simple life at your own peril. By conveying all of these important themes in between snappy dialog and revealing exchanges between Hera and Ezra, "The Call" solidified its place as a standout episode of Star Wars Rebels season 2. You can read all of my Rebels reviews right here. Star Wars Rebels review: "The Honorable Ones"
Star Wars Rebels review: "Homecoming"
Star Wars Rebels review: "Legends of the Lasat"